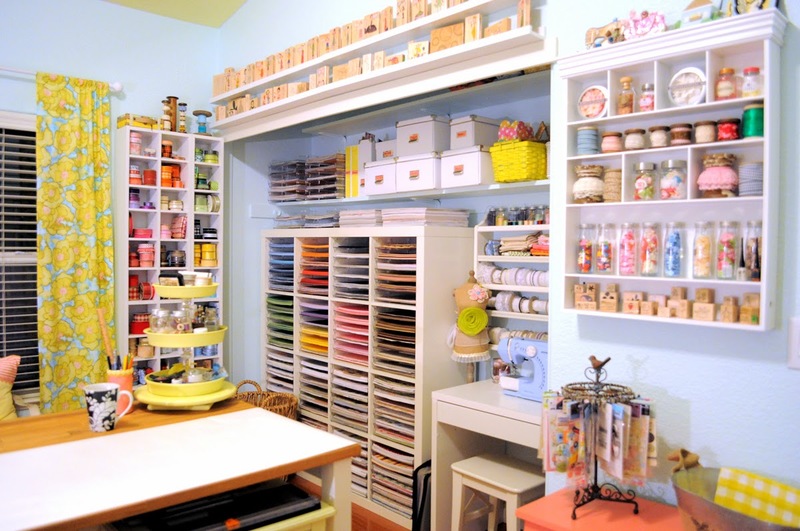 Craft storage furnishings for the modern crafter! 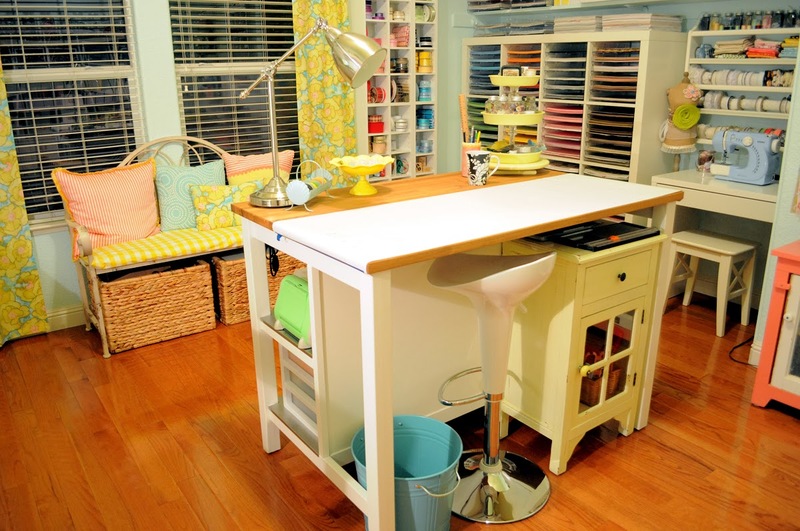 It’s Sharon from Glitter Angel Designs here to share with you some ideas for craft desks. This is something I’ve been thinking about a lot lately, as I’m getting close to the arrival of my new garden craft studio. I know that I want to have both a desk area to sit at, and something at standing height. I currently use a glass-topped desk, which is great for cleaning up, and looks nice, but when I stand at it to use my Big Shot, I get a backache after a few minutes so I know having something at counter height is a must for my new room. I like the modern look of it, and I think it will fit well in my new room, which is going to be mostly white. One added bonus to having a glass-topped desk is that you can put a desk lamp underneath the desk and use it like a light box – very useful! 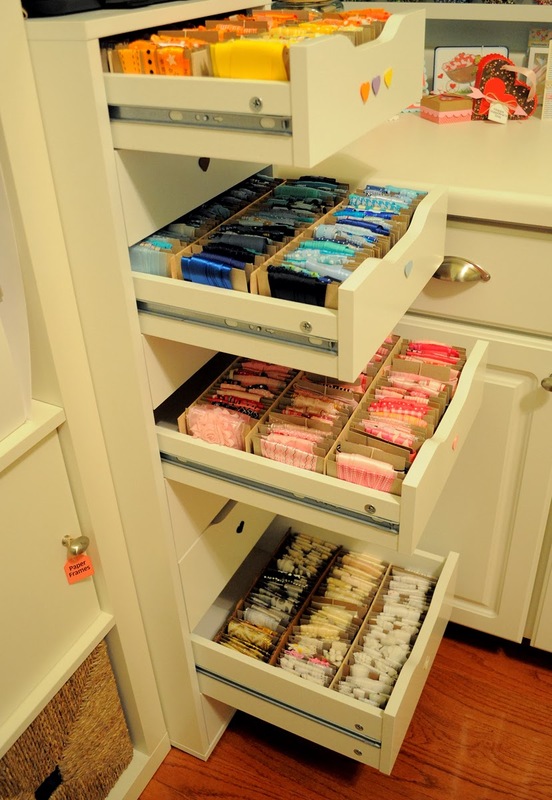 If you are short of space in your craft room, then the desk addition to the IKEA Kallax shelving is a great solution. If you have an unusual space, or want something adjustable, then Ikea really does have some great options. They have a whole range of separate table tops, legs and trestle bases, so you can create something completely flexible. If you have a specific space you want to fit your desk into, you could even get a piece of counter-top cut to the exact size you need, then just use some trestle bases to support it. You can view the whole range of IKEA table top and leg options. I particularly like this one, since it has the lovely glass top I like, and is completely height adjustable. And it’s on sale (in the U.S. at least) through August 5, 2015! For something at standing height, again Ikea seems to have a good solution. I’ve seen this kitchen island (below) featured in quite a few craft rooms, and in larger rooms I’ve also seen two units together to create a great, large working area. There’s lots of handy storage space underneath too. I hope I’ve given you a few ideas for your craft room – maybe you’ll see some of these products in my new room over the coming months, once I start shopping! Thanks for stopping by and please swing by my blog, Glitter Angel Designs, and say hello! Hi everyone it’s Sharon here, and today I’d like to share one of my favourite craft studios, belonging to the very talented Regina Easter of Hand to Paper. What I love most about Regina’s room is that she manages to have a lot of stuff on display, but still manages to create a clean, organised look. It’s very easy when you have open shelving like this for everything to look cluttered and the colour scheme not appear cohesive, but Regina pulls it off, and her cheerful colour scheme just ties it all together and it looks amazing. I really like her central island for working. This is what I am missing in my current temporary room. I find that die cutting and stamping are so much easier when standing up. A lovely Island like this one is top of my shopping list. Regina has an amazing amount of photos here on her Flickr pages, you can see all the updates she’s made for her room since these pics, and if you want to check out her blog page with full details about her room, you can find it here. Hope you’ve enjoyed joining me for this tour of Regina’s gorgeous room.